The origin of the Flemish Public Observatories can be traced back to the successful Apollo space project resulting in the first landing and footsteps on the Moon on July 21, 1969. This event did not only raise interest in space technology, but basically in everything that was ‘space related’, including astronomy. The foundation of public observatories Mira in Grimbergen and Urania in Hove was the short term result. The enthusiastic efforts of the late Armand Pien, a very popular meteorological presenter on television, resulted later in four more Public Observatories: Beisbroek (Bruges), Cosmodrome (Genk), Armand Pien (University of Ghent) and AstroLab IRIS (Ieper). In this way a close network of actors in the field of popularisation of astronomically related sciences was born in Flanders and which is unique when looking at it in an international context. In Bruges, in the late seventies of the twentieth century, the idea grew between some prominent amateur astronomers like Harry De Meyer and Gaby Tack to start a local public observatory. When Herman Ghyoot, currently honorary chairman and founding chairman of Volkssterrenwacht Beisbroek, became city council member in 1977, he convinced the council to invest in such an educational project. A part of the Beisbroek manor House was refurbished and an observatory tower adjacent to the house was constructed and outfitted with the necessary telescopes next to a small planetarium. On October 20, 1984, the association Volkssterrenwacht Beisbroek vzw was founded and on March 30, 1985 the observatory was opened by Armand Pien. Originally the activities were all organised by voluntary amateur astronomers. From 1997 it became possible to hire a permanent educational and administrative co-worker. This obviously opened the possibilities to welcome more visiting groups during the daytime. Following the millennium, part of the infrastructure of the visitor centre needed renewal. On March 30, 2002, the brand new Zeiss ZKP3 planetarium projector was brought into use. At the same time a renewed interactive astronomy exposition was opened to the public. The sweet taste of renewal led to the inauguration on July 4, 2004 of a planet-walk in the Beisbroek park, combining art and science. In the winter of 2006, a fully computerised telescope mount was installed and in the same year the tea-room Koetsenhuis was acquired by the association, which meant a significant expansion in workspace and room for lectures. 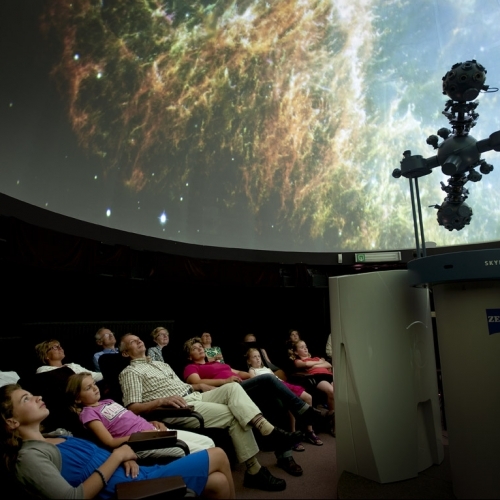 A more recent addition to the planetarium was officially launched on Dec 20, 2008: then the full dome video projection system was taken into use. All these evolutions resulted in the fact that the original seventies concept of a ‘public observatory’ is only partially covering the activities anymore. It can be stated that today we are evolved into a small scale ‘science centre’- obviously with astronomy and related sciences at the forefront). To express this evolution, the visitor centre received a new name ‘Cozmix’ at the end of 2012.